Compass Rosie set sail from the port of Tiddlywinken on October 31, 1501. Her crew loved the sea and they loved to sail to faraway lands. Visiting new places and learning new things was great fun. Every time they returned to Tiddlywinken, they brought interesting souvenirs, exotic gifts and exciting tales. As the years went by, the crew grew older and older. The hard work of sailing a ship grew harder and harder. One day, the Captain announced that it was time for Compass Rosie and her crew to retire. The crew agreed but they were sad. It was good that they did, because once they left the ship, Compass Rosie mysteriously sank where she was anchored, leaving only her top decks and masts standing out of the water. In the years that followed, as the crew members passed away one by one, they were laid to rest on a hilltop overlooking the sea. From there, you could also see where Compass Rosie lay in the harbor. You might think this was the end for Compass Rosie and her crew, but a most unusal thing happened whenever one of the sailors died. Once prayers had been said and all the mournful family and friends had gone back to their homes, the sailor's ghost slipped out of his grave and floated down the hill to rejoin his mates on Compass Rosie. Click here to watch. As more and more spirits returned to the ship, she began to glow brighter and brighter on moonlit nights. Word spread that she was haunted. Before long, the whole crew had reassembled and they were eager to set sail again. Unfortunately sailing a ship was still hard work that required muscles and ghosts don't have muscles. They wondered what to do. Fortunately, another unusual thing happened. In a nearby farmer's field, there were three scarecrows: Tattie Boggle, Slim, and Captain Red Coat. The farmer had dressed them as pirates and had given them pumpkins for heads. One day the scarecrows decided that scaring crows wasn't all that much fun. They would much prefer to be real pirates, to sail the seven seas and to dig up treasure chests left by other pirates. So, they quit their jobs as scarecrows, took their savings out of the scarecrow bank, and went to the harbor to buy a ship. Compass Rosie was the only ship for sale. The fact that she glowed in the dark and might be haunted didn't bother the scarecrows, who had decided to call themselves the Three Pumpkin Pirates. They bought the ship, repaired the hull, bought new sails, made friends with the ghosts, and prepared to set sail. Ever since then, the Three Pumpkin Pirates have sailed here, there, and everywhere, looking for adventure. The ghosts of the original crew are having a wonderful time, happy to be at sea again. 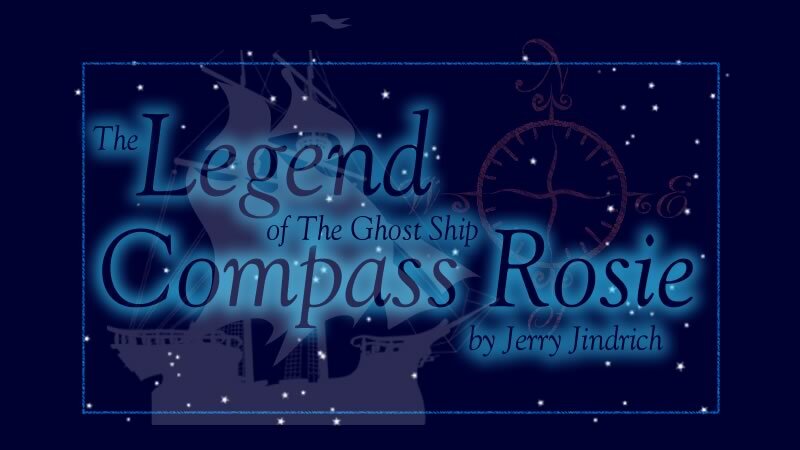 Would you like to take a Tour of Compass Rosie and meet the tricky ghosts? Before you can climb on board, you need to help Tippity Witchet make it completely visible. It's a big job and her magic is not quite strong enough. Please say the magic words, "Moofity-poofity!" and point at the ship with your mouse pointer. When it becomes clearly visible, click on it. Would you like to see what the Pumpkin Pirates discovered on their Voyages? Click on the totem pole to see photos from around the world. ©2001, 2011, 2015 Jerry Jindrich. All rights reserved. Revised 6/15/11.